Curiously, peas, gooseberries and dried fruit filled bottles were placed "with their necks downwards" in holes cut into shelves to exclude air. Anyone heard of this before? 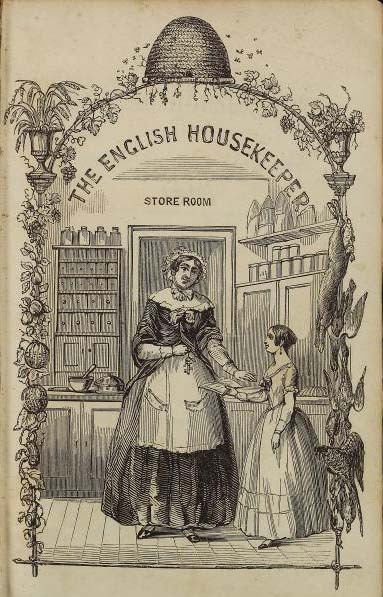 "Every housekeeper knows the value of a good Store-room; for it seems to be little less essential than a good kitchen. Few modern town residences, except those for large establishments, have a store-room sufficiently large to answer all its purposes. In the country a good store-room is so indispensable that where there is none it ought to be built; it should be on the same floor with, and as near as possible to, the kitchen; and as this would be on the ground floor, it would be necessary to make a cellar underneath, or to raise the building a little distance from the ground, to prevent its being damp, above all things to be guarded against, in a place where stores are kept. It may, perhaps, be kept dry by flues from the kitchen fire; and this would be a saving of fuel and labour; but if not practicable, the room should have a fire-place. Preserves and pickles require air; they will ferment if shut up, or the place very warm; and, therefore, open shelves are best for them; and they should be at a convenient distance from the ground, so as not to be out of sight, for they ought to be examined frequently, and the coverings dusted. For bottles of green gooseberries, peas, or any kind of fruit preserved dry, without sugar, have shelves with holes in them, to turn the bottles with their necks downwards. This effectually excludes the air. A dresser is a convenience in a store-room; or a table in the middle of the room may answer the purpose; but in either of these, or at the bottom of the linen press, there should be drawers for dusters, tea-cloths, &c., &c., unless they be kept in the Pantry. There ought to be a place in the store-room appropriated to groceries, for they, too, should be laid in, not oftener than two or three times a year. The price of starch varies with the price of flour; and, therefore, as it keeps well, a stock should be laid in when flour is at a low price. Rice keeps very well, and is useful in a family, particularly in the country, where new milk and eggs are plenty. We once kept a quantity more than three years, by spreading a well-aired linen sheet in a box, and folding it over the rice, the sheet lifted out on the floor, once in two or three months, and the rice spread about upon the sheet for a day or two. This had the effect of keeping away the weevil. Jars and canisters, with closely fitting lids, for tea, sugar, coffee, cocoa, mustard, pepper, spices, and such things, will last many years. To dispose of these things properly, they should be kept in a closet, some in earthen jars, others in tin or japan boxes; and the spices in little drawers very closely fitted. If drawers, which are preferable, they should be labelled. 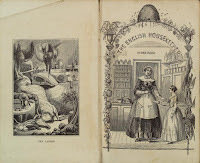 As it may be convenient sometimes to perform little culinary matters in the store-room, there should be a rolling pin, pasteboard, and pestle and mortar kept there, in addition to those of the kitchen, and on this account a small marble slab would be very useful, for making pastry in hot weather. The fire-place might have an oven attached to it; for though it would be imprudent to heat the store-room, on account of preserves, &c., it may be occasionally used, when there is more cooking than usual. Besides which, in the season for making preserves, a hot plate in the store-room would be found useful. 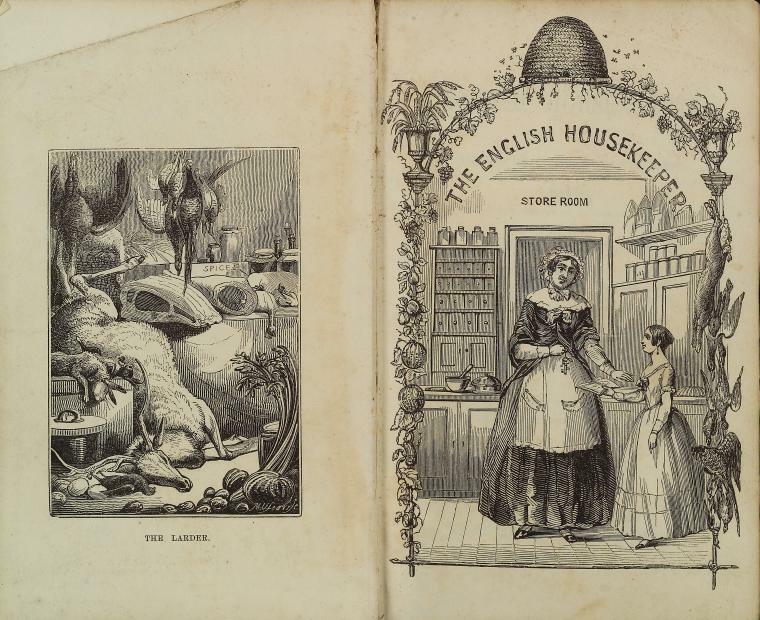 Weights and scales of various sizes are absolutely necessary, that the housekeeper may be able to ascertain the weight of the largest joint of meat, as well as of the smallest quantity of spice. Care should be taken to keep these in good order.—A hanging shelf is also a good thing in a store-room. Here the flour-bin may find a place, if there be no other more suitable. If it be sufficiently large, and there be no other place for the purpose, there might be a closet, or press, for household linen. This should always be kept in a dry situation, and in some houses a small room is fitted up, with closets or presses round it, some of these having shelves or drawers for linen, and others with hooks, for a variety of things belonging to a family; but in this room there ought to be a fire-place, unless it be aired by one adjoining. In the store-room, there should be a closet or shelves for china and glass, not in every-day use. But as these ought to be free from dust, open shelves would not be so desirable as a closet; and if expense is not of importance, glass doors would be the most convenient. There should be boxes for candles and soap, but as these smell, the store-boxes may be kept in a garret, or some dry place, and a smaller quantity in the store-room for immediate use. Late in the summer is the best time to provide the year's stock of candles and soap. Both are the better for being kept some time before they are used: and the latter should be cut in pieces the size required for the different household purposes, and left, before packed in the box, a few days exposed to the air; but not in a thorough draught, for that would cause the soap to crack. It is mismanagement to buy candles a few at a time, and soap just as it is wanted; and not good to buy cheap candles. The dearest articles are not always the best; but it is very certain that the best are the cheapest. Good candles afford more light than bad; and do not waste, particularly if they have been kept some time, even for a year."